Sad news out today from Picture Polish. Ozotic discontinuing a huge part of their line. Not just one or two polishes, nope, the whole 500 series!! Which ones are in the 500 series you ask? Well... all the Multi-chromes, all the Holographics, all the Mish Mash and all the Elytra's. Discontinued. Done. Dead! If you want to snap up some bargains, get over to Picture Polish now and grab a bottle of the discontinued ones for just $11AUD. 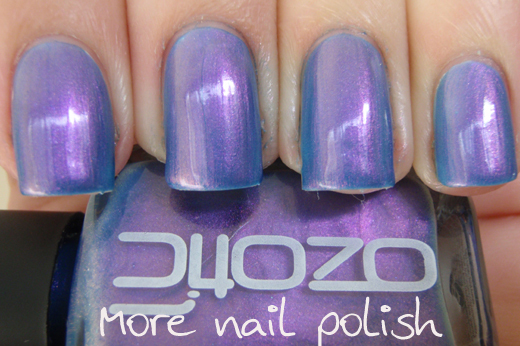 Picture Polish said on Facebook that they hear Ozotic has something new on the horizon. All I can say Ozotic, is it better be pretty bloody awesome for you to stop making the 500 series. The 500 series of polishes are so loved and seem to sell so well, I really can't understand why they would discontinue them. They are continuing to make the 600 and 700 series. The 600 are the high impact holographics, or the large particle holos (which are gorgeous in their own right). The 700 series are the duochromes. And it is another one of those that I have for you today. 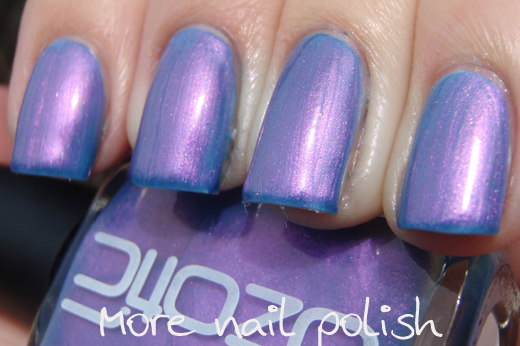 This is Ozotic 744, a cornflower blue and purple duochrome. First up is two coats of 744 layered over black. Over black you see a pretty dusty lavender purple. There is a definite dusty blue colour shift. Next I layered it over white. Over white the purple shimmer is still very definitely there, but you see a lot more of the cornflower blue shade. Like! It doesn't look like a totally different polish over white, but it certainly brings out some of the other shades in the polish a lot more. I think I prefer this polish over white rather than over black because you seem to see more colour shift over white! That seems the total reverse that what we usually see. Finally, I just wore two coats of 744 on it's own. I said it on Monday with Ozotic 730, and I'll say it again now. I do really love that you don't have to layer these duo-chromes over black to bring out the colour shift. Sometimes I just don't like that black dirty look under the nail, that layering over black can make. So this is another win in the duochrome department. It's a really pretty combo of colours. Purple and blue are always perfect together, but I love that this is light cornflower blue and a lavender purple. So people, we may not have shown these Ozotic duochromes much love in the past, but soon, these will be some of the only Ozotics that we can show love too. I wonder if this means that there will be no more Chemistry or B Range 500 series too? 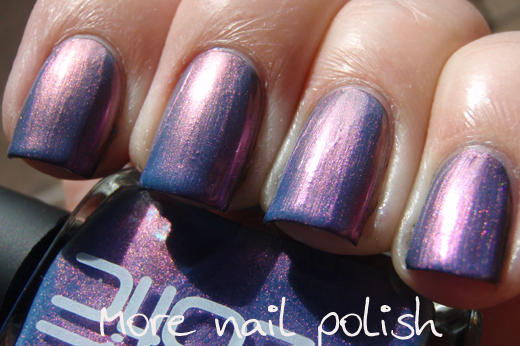 That's almost unbelievable, Ozotic discontinueing their best colors. I mean, the duochromes are nice, but not near as pretty as the multichromes. I'm so happy that I actually have all the Ozotics I wanted, but still. For now I'm very curious what they will bring to replace the 500 series. Discontinued the whole 500 series. In my opinion is series most beautiful , and 500 series is by far the highest selling . I do not understand, it's a shame. The 600 series, has a much lower holography. For example: ozotic 518 and ozotic 618. That says it all ..
Im guessing it's about price. I have 505 and 526, and they are some serious holo action with excellent coverage. I bet you they were losing money, and the numbers projected that would not be making money back in a timely manner to continue the line. Isn't that why Clarins 230 got axed? It was too expensive to make. Even it was pennies per polish, it would still drag them down. Sure you can charge more, but maybe that was something they just didnt want to do. I agree, the next line better be amazeballs. There's a really high expectation now. Llarowe will be selling them until they are cut off from production June 30, so there is still time to order, ladies! It's true, I'd like to buy a load of all the 500 series. When I saw the news I just was not believing! Why any brand would eventually finish with his golden eggs chicken? For me... I prefer to believe that this is a marketing move, and some day, they will return, with another name or another bottles! Wow, this is so gorgeous! I need to have some of this brand. I can't believe so much is being discontinued! Why??? Lol! gah! why you make me want polish I already have!! !